It looks like chicken but is actually seitan (mock meat, also called wheat meat). Seitan is so easy to make and so versatile as a substitute for meat. 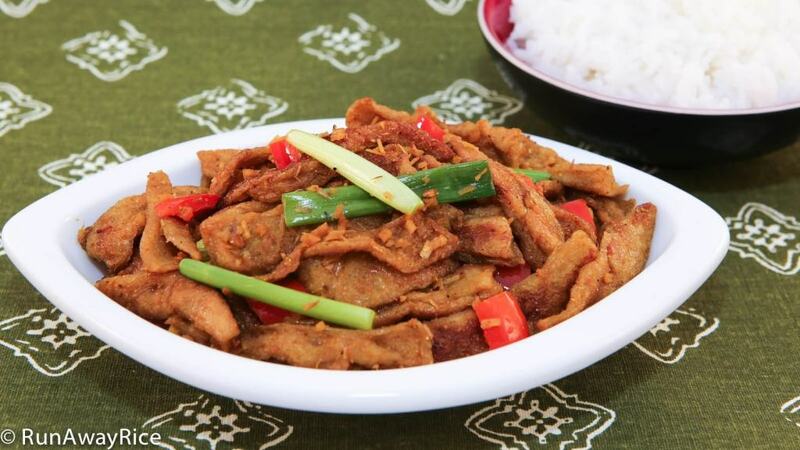 In this dish we combine pan fried seitan strips with fresh lemongrass and spicy curry powder to make a super simple and super tasty vegetarian dish. Whoever said being vegetarian meant eating boring tasteless food never tried this flavorful dish! Give it a try and let me know what you think. I shared the recipe for seitan earlier so please be sure to read that recipe. If you don’t have time to make homemade seitan, you can use the store-bought variety. If you enjoyed this recipe, you may also like: Mock Roast Pork/Seitan Roast Pork (Mi Can Xa Xiu) and Braised Seitan and Vegetables (Mi Can Kho Chay). Cut boiled seitan into thin strips. Add 1 tsp of vegetable oil into a large wok or nonstick pan and pan fry 1/3 of the seitan over Medium heat until the pieces are golden brown. Fry the seitan in small batches and leave plenty of room so they don’t stick together. Set aside in a bowl. Cut green onions into 2-inch sections and then into thin strips. Chop the peppers. Heat the same wok or pan over Medium High heat and add vegetable oil. Add the lemongrass and stir fry for 30 seconds. Add the peppers and stir fry for 1 minute. Add the seitan and stir fry for another minute. Add the sugar, curry powder and soy sauce and continue stir frying. Cook for another minute. Turn off the heat, add the green onions and black pepper and toss together. This recipe looks interesting! I have yet to try making Seitan, though I certainly will before too long! I don’t know if I’ll like the taste of it, but if I don’t, I’ll just use chicken. I’m learning how to stir-fry, having bought a non-stick stir-fry pan. I love Lemon Grass and am eager to try just about anything with it in it! Thanks for the recipes and videos! The videos help a LOT and make everything look so easy!